Handmade fontage and Chinese style fans are the perfect accompaniment to a Shi Shi L'Amour headpiece. A Shi Shi fan is coy, feminine, mysterious and elegant. Have a fan made to match your headpiece, handbag, shoes, or entire gorgeous outfit. 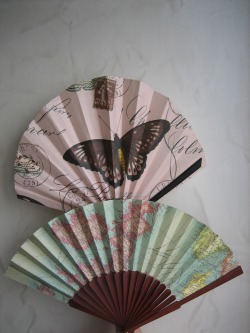 Paper fans are currently available, made in colours of your choice and shipped worldwide. Please email Katie if you're interested in having a Fontage or Chinese fan made for you. Material fans to follow later this year.